Although toolbars are supposed to be useful and beneficial extensions to browsers, FileSendSuite Toolbar is, unfortunately, none of those. This has been categorized as a bad toolbar by our malware researchers because it might raise some security issues. Apart from changing your browser settings, this toolbar can also collect information about your online activities and share this with third parties. The presence of this useless extension can also mean that there may be other potentially harmful applications on your computer. It is very important to understand the danger in keeping this toolbar on your system and why we recommend that you remove FileSendSuite Toolbar right now. Please read our article to find out more about this infection and the possible threats it can pose. FileSendSuite Toolbar comes from the Mindspark toolbar family and is very similar to AudioToAudio Toolbar and RetroGamer Toolbar. It has a legitimate-looking website, filesendsuite.com, where it claims to enable users to send files via URLs, provide easy-access links to file sharing tools and secure online data storage. You can directly install it from the website; however, this toolbar can also come in free software packages. Keep in mind that a bundle can be potentially harmful because third-party installers might contain malicious applications beside the freeware. This means that you may have to face multiple security threats if such a package gets installed on your system. Therefore, it is important that you delete FileSendSuite Toolbar and all other potentially harmful applications. Most users get infected with FileSendSuite Toolbar because they visit file-sharing websites and click on a corrupted download button. 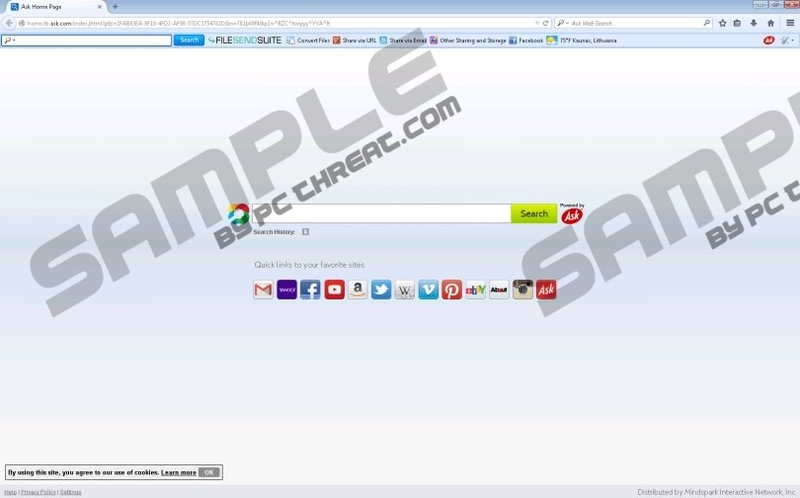 In this case, you will notice the change in your home page and search engine when both are set to Ask.com without your permission and this toolbar appears. It is also possible that you have skipped a step in the installation process where you still may have an opportunity to say no to this tool or the browser changes. FileSendSuite Toolbar uses a third-party search engine, Ask.com, to display search results. However, it collects data about your browsing habits to share it with third parties so that it may insert third-party ads and sponsored links in modified search result pages. Clicking on such links might put your system’s security at a variety of risks. You might be redirected to unreliable websites operated by schemers who might deceive you into disclosing your personal and banking data, which they might use to commit online scams and even steal your money. But you can get a number of malware infections, too, just by simply landing on an infected website. Therefore, it is very important to be careful about where you click because you might risk our privacy, money, and the security of our computer. The best solution is to remove FileSendSuite Toolbar before you get exposed to such scenarios. Since FileSendSuite Toolbar affects all the major browsers, it is not enough to uninstall it via Control Panel. You also need to reset your browsers to make sure that Ask.com gets cleared as your home page and default search engine. This will take care of the unwanted extensions as well. If you are not an experienced user, please follow our instructions below the article. Please, do not forget about the other infections that may be still hiding on your system. The easiest way to address this issue is to install a reliable antimalware program, which automatically removes all known infections and protects your PC from future attacks. Find the application in the list and click Remove. Tap Alt+T simultaneously and select Internet Options. On the Advanced tab click Reset. Tick the Delete personal settings checkbox and click Reset. At the bottom of the page click Show advanced settings. Click Refresh Firefox. Click Refresh Firefox again in the confirmation window. Quick & tested solution for FileSendSuite Toolbar removal.